What is granola anyway? Those yummy sweet clumps of crunch. I never really thought about it until we decided to photograph a healthy breakfast image and developed our own recipe for it. Granola is typically a mixture of oats, dried fruit, nuts and a sweetener such as honey or maple syrup, baked and broken into those “sweet little clumps.” It can be served as cereal either hot or cold, eaten as a hand-held snack, or sprinkled over yogurt, ice cream or fruit. I am a real maple syrup fan, and if it were just for me, I would have developed the recipe using all maple syrup, but I decided it would be better to round out the flavor by using both honey and syrup. – Use old-fashioned rolled oats, not quick cooking or steel-cut oats. – “Add in” ingredients are endless. 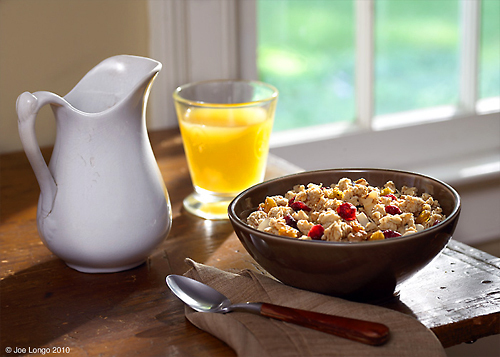 Start with the base granola recipe of oats and sweetener, then add your favorite extras. – Be creative with add-ins and spices! Try dried fruits such as cranberries, blueberries, apricots, apples, raisins, dates, & pineapple. Also experiment with nuts, flax seeds, sesame seeds, sunflower seeds, shredded coconut, chocolate chips, and candy bits. Choose from spices such as ground cinnamon, ground ginger, ground nutmeg, or ground cardamom. – Nuts should be added to the oat mixture before baking, as this will toast them, bringing out their flavor. Dried fruit will taste fresher if added after the granola is baked. Chocolate chips and candy bits should be added after granola has baked and cooled. – If adding spices to your granola, add them into the warmed sweetener (honey, maple syrup) before pouring it over the oats. – Recipe can be made with just honey or just maple syrup depending on your taste buds. – To store, place cooled granola in a storage container with tight-fitting lid. – Preheat oven to 275F. Place oats in large bowl. – In small microwave safe bowl, microwave honey, maple syrup and cinnamon on MEDIUM until warm about 15 seconds. Pour over oats and toss until well coated. – Spread oat mixture evenly on baking sheet. Bake 25 to 30 minutes just until it starts to turn golden in color. – Cool in pan on wire rack. Break into small pieces. Transfer to large bowl and stir in cranberries, apricots and coconut. – Store in airtight container up to 3 weeks. Here it is!!! I am slowly getting my kitchen back, so I was able to develop the syrup recipe. We photographed it with buttermilk pancakes, but you can use it on a number of things. I just poured the warm syrup over vanilla bean ice cream!! Creamy, syrupy, blueberry-ee — so good!! Serve it over pound cake, fresh fruit, waffles. You can even use it as a glaze for pork! – Recipe can easily be doubled. – I think the syrup is best served warm. Just heat in microwave about 30 seconds on High. – Ground cinnamon can be optional. I love it so I put it in everything! I found out it also has some health benefits — it can help with blood sugar, clotting issues, soothing an upset stomach, and reducing arthritis pain. Who knew?? – In small saucepan, place 1/2 cup of the blueberries, and remaining ingredients. Heat over low heat until sugar dissolves, pressing blueberries against side of pan with spoon to crush slightly, about 4 minutes. – Pour mixture into a fine strainer which is set over a bowl. Using back of spoon, press berries to release all the liquid. Discard the solids. 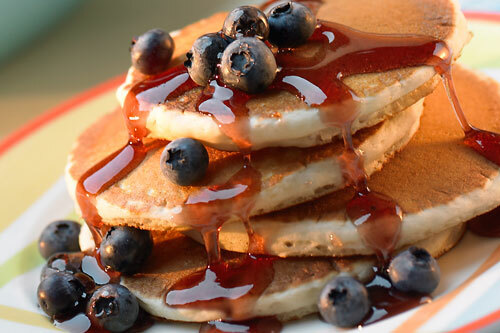 To the syrup, add remaining blueberries. – Store covered in refrigerator until ready to use.